Bauder roofing systems are ideal for lightweight, fast track and cost effective construction projects. The systems provde solutions that are durable, resistant to the elements and are able to support extensive green roofs and BauderSOLAR photovoltaic arrays. All Bauder single ply systems meet current UK Building Regulations Part B for External Fire Protection. The system are installed using hot air welding techniques with mechanical fastenings or adhesive bonding to provide solutions that are durable, resilient to the natural elements and give excellent fire resistance. The quality and experience of the installing operative is paramount to ensuring a successful project. County Flat Roofing, as Bauder approved contractors are fully trained and certified to install Bauder products. Proving the necessary experience that a Bauder exceptional guarantee demands. 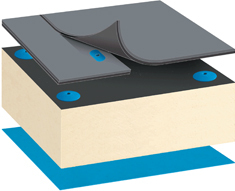 The mechanical fix options for either single ply system makes it possible to remove independent components. If only the membrane requires renewal, this element can be replaced without affecting the insulation and vapour barrier. 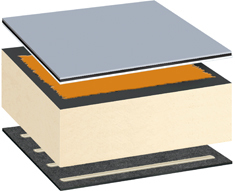 Bauder PIR insulation is CFC and HCFC free with zero ODP and extremely high thermal efficiency. Recycled materials to a minimum. Bauder reduce water consumption by using automated rotation cooling systems in our manufacturing productions, drastically reducing energy use and avoiding pollution of the environment.